Source: 1. "Up Tullow Street" an article in The Advertiser by Michael Purcell c 1992. Carlow in Old Pictures & Carlow in Old Pictures Vol 2 by Michael Purcell & The Official Guide to Carlow 1985-86. Additional edits & images by M. Brennan, J. J. Woods, Anna Nolan Gough & Dermott O'Brien. 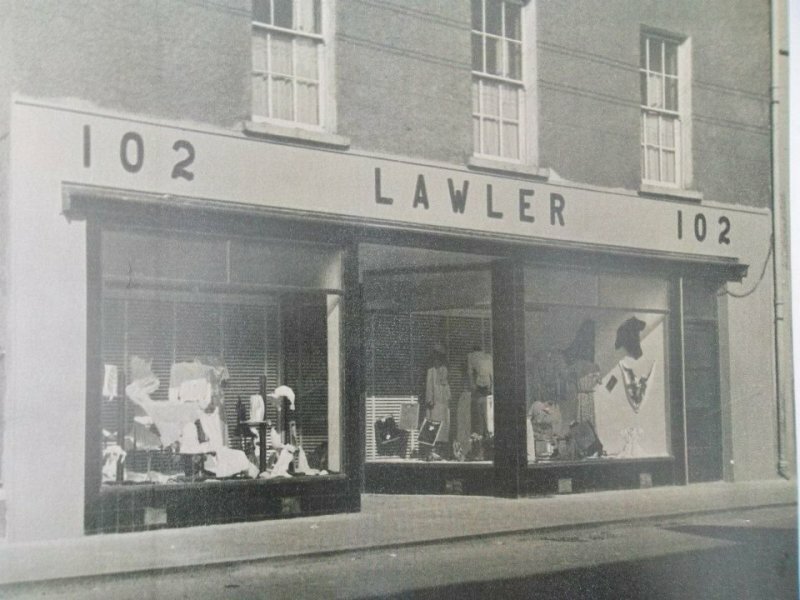 79, 80 & 81 Tullow Street - Lawler’s the Plough bar and lounge and Undertakers, was originally John Whelan’s ‘Plough Hotel’. Jimmy Cummins was manager here for awhile. 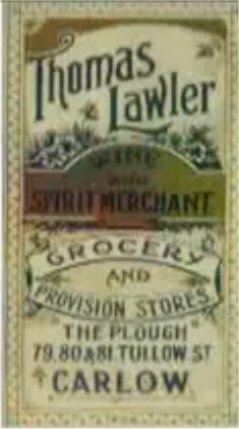 Thomas Lawler acquired the Plough in the 1920’s. The sign “Cod Speed the Plough, is still to be seen outside the premises. Richard Byrne had a Motor & Cycle Works and Garage. He was also a Haulage Contractor at No. 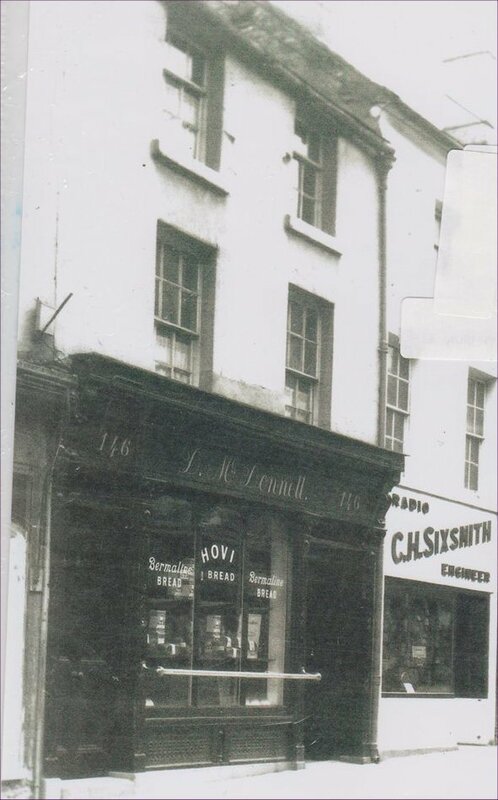 80, Tullow St., now occupied by part of the L & N Stores and he had a Confectionery Shop at No. 39. Michael White, Pharmaceutical Chemist, is now the occupant. 80 - 81 Tullow Street - Racey Byrne's 'The Plough' (this information was taken from an advert for Bushmills Irish Whiskey. The tiled floor, brick walls, messenger boy bicycles, old barrels, saddles and a selection of varyingly sized copper jugs hanging from the beamed ceiling together with the myriad of enamel signs and pub memorabilia give Racey Byrne's a certain ambience. 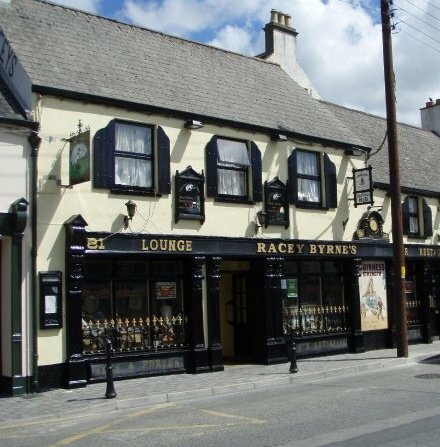 Located in centre of Carlow town, the building dates back to 1678, and there's been a pub on this site since 1829. The bric-a-brac is matched by the colourful locals, who frequent this old-style pub. The atmosphere is convivial and chatty and the proprietors and bar staff are particularly friendly, giving this pub a feeling of instant warmth. 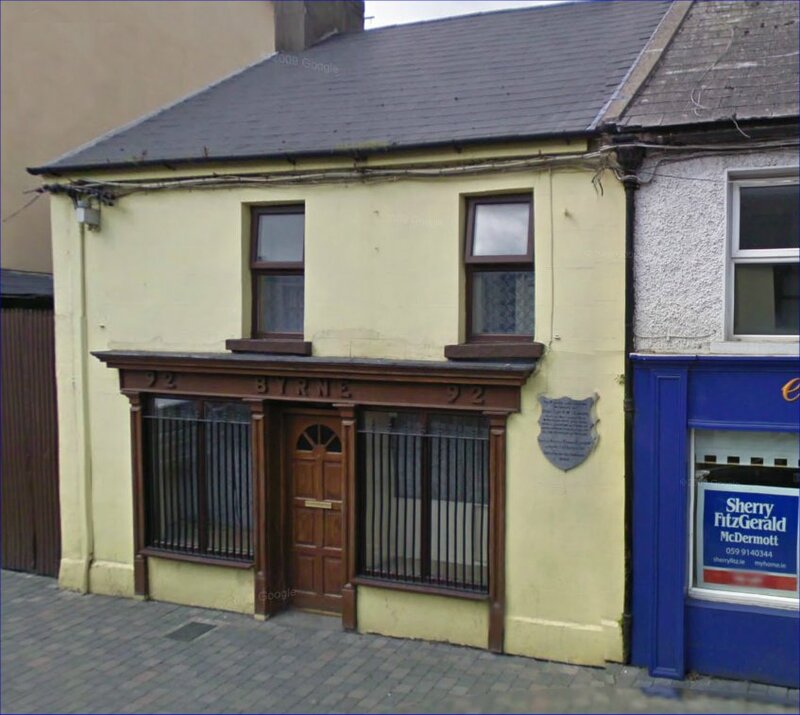 82 Tullow Street - R. N. Gillman Dental Surgeon was previously a store for the L. & N. and Lawler's at one time established a butcher’s shop here. Where we now have the entrance to the L. & N. Supermarket there stood several premises. 83 & 84 Tullow Street - No. 83 was originally home to Tom and Mary-Anne Byrnes; No. 83 and 84 was also a provision shop and public house for years. They employed as their barmen, Dan Murray and Tom Meade. Byrnes had a large yard where people were invited to leave their horses while shopping in town. They was also a funeral undertakers and hired out sidecars and wagonets. 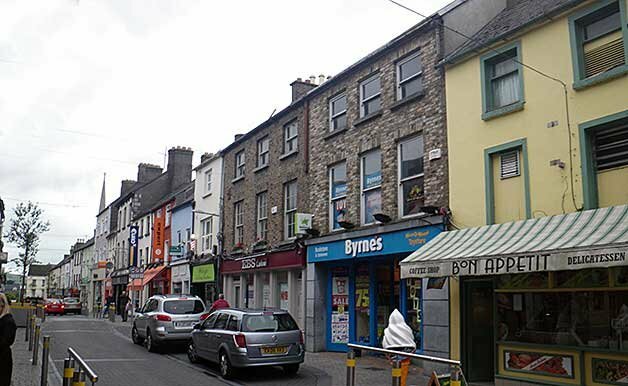 Tom Byrne was father of P. J. Byrne who was a solicitor to the Board of Guardians, Board of Health and the Urban Council; William was also a solicitor, Edward was an auctioneer and Thomas Byrne who took over his father’s business before selling out to Cunninghams who were succeeded by Shevlins Bar Grocery and Bakery. Beside Shevlins was James Haydens, Bootmakers shop. 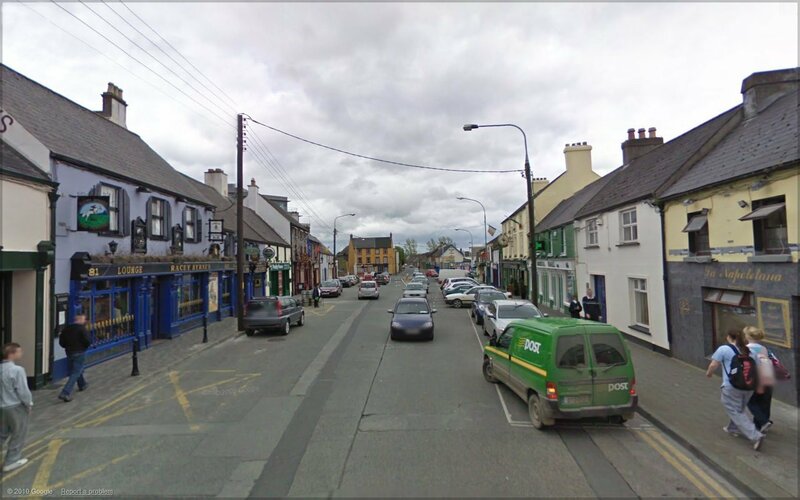 He lived with his sons, Patrick, who married Ellen Purcell (Tullow Street, Carlow). They had no children but later he became a famous handballer, and Michael who later established a confectionery shop at 42 Tullow Street, where the Nationalist now have their stationery shop. Haydens were replaced by Brennans and upon Ina Brennan's death the premises was sold to the L & N.
Lismard House Development which comprises Uptown Hair Fashions, Murph’s Shoe repairs and Key Cutting etc, The Celtic Bookmakers, Knits and Bits, D Tile Store, Kellistown Glass, Ken Black super toys and nursery, Tamaras Pizza & Pasta Restaurant and C.K.R. Radio Station. 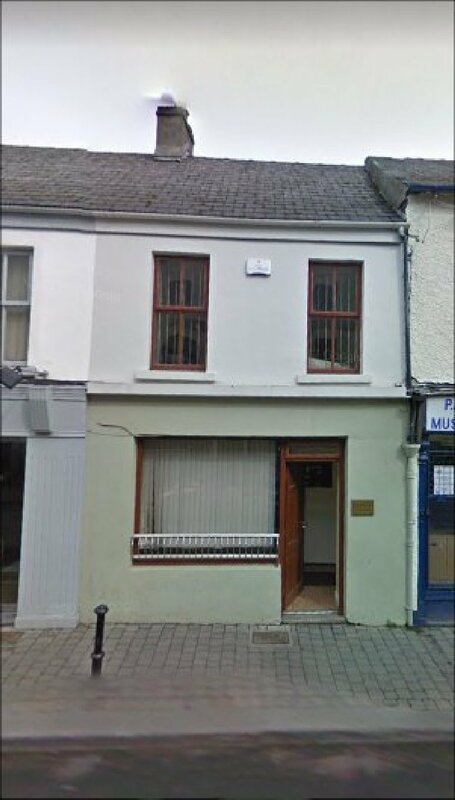 85 Tullow Street - Used to be Finnegan's Turf Accountants. My cousin Mary Murphy (nee McDonald) worked there for a great number of years. 86 Tullow Street - In the 1930's William Purcell & Sons, were Ironmongers, Coach Builders & Undertakers. They also repaired motor lorry and van bodies with rubber-Tyres a specialty. Sadly the premises closed on the death of the owner and have remained closed ever since. This photo was donated to the Carlow website by Anna Nolan Gough. The pair standing in the door should be Patrick and Edward J. Nolan. The Chemist shop was leased from Bill Purcell. It opened in January 1935. 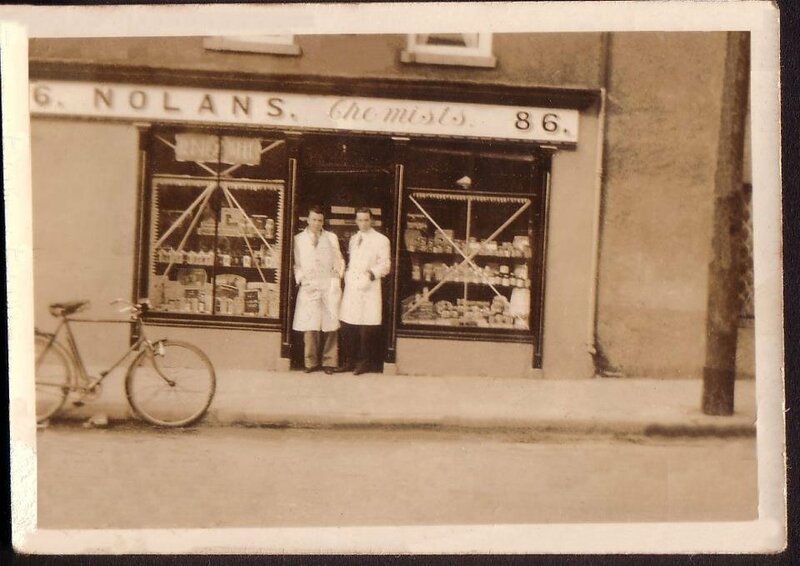 Nolan's later re-located to No 1 Dublin Street this shop also had an entrance from Tullow Street. 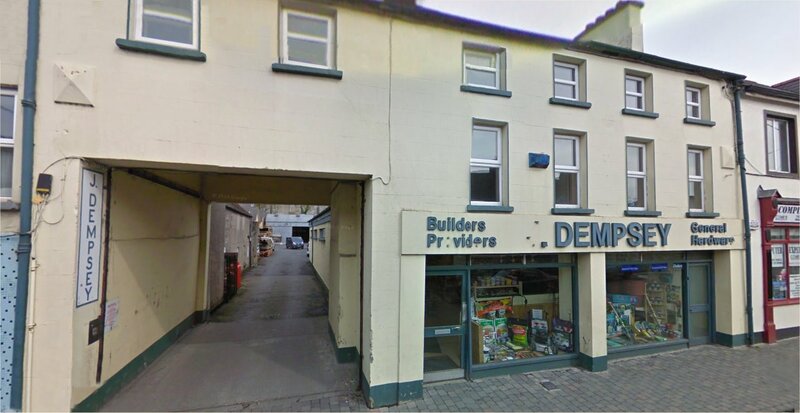 The building is the former Ironmonger, Wheelwrights and Undertakers premises of Bill Purcell, situated beside Dempsey's Hardware shop on Tullow Street opposite Mary Theresa Kelly shop ~ based on a copy of the Nolan / Purcell Lease that I sent to J. J. Woods some time ago. The year should be c.1936. Bill Purcell was grandfather to J. J. Woods and granduncle to me. The building was used in later years as the Fianna Fail Headquarters during election campaigns. Some years ago the building was demolished and is now a hairdressers. Source: Michael Purcell. Lismard House now stands where 86 was originally located. Just a little note of personal interest from J. J. 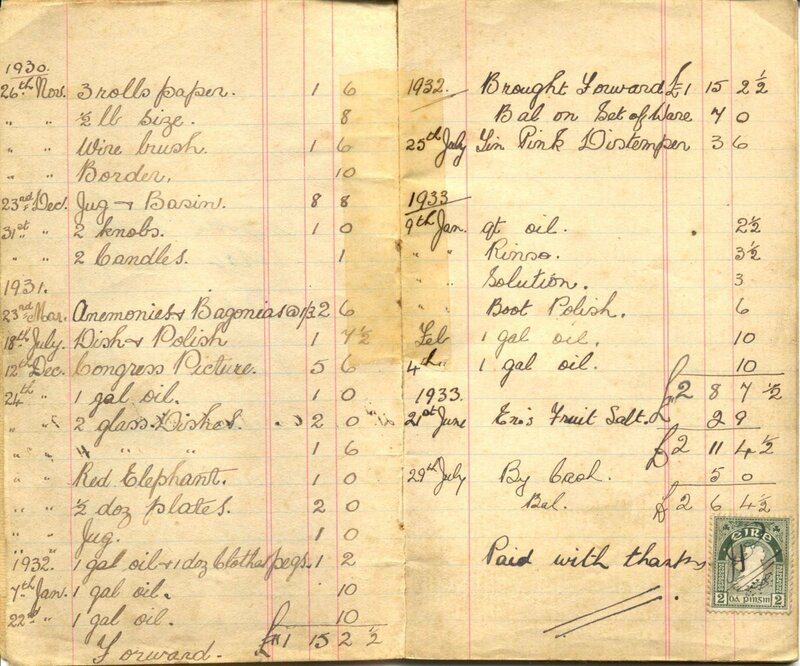 Woods in relation to the account book is that the handwriting is that of my late mother. She used to run the hardware shop as well as running the house up to the time she got married. She was Julia Purcell and her family had the hardware business, coach building and funeral undertaking operating from No. 86. Tullow Street. 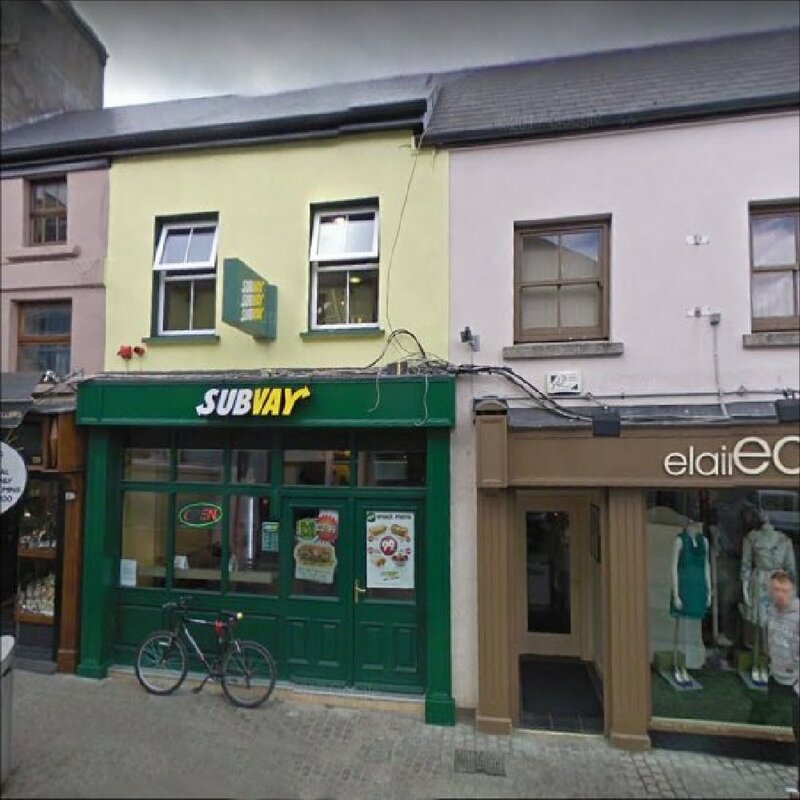 87 Tullow Street - This was Rafters Bakery before it was acquired by Whelan’s. Whelan sold American flour and American bacon, dairy and agricultural salts, Jarro and English coal. He was an extensive corn and coal dealer and he had stores in Bridewell Lane in what was formerly the Old Gaol. Whelan also kept stables and had some very fine racehorses. This premises was also occupied by Jimmy Farrell's Hardware, which is now James Dempsey's Hardware. 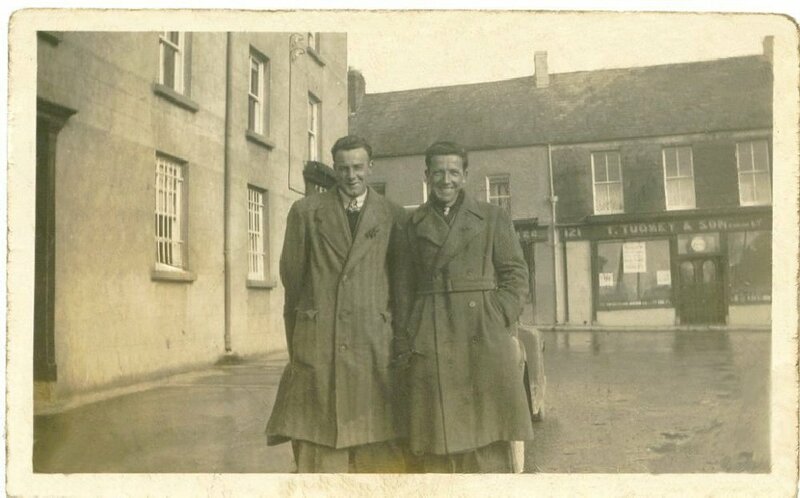 88 & 89 Tullow Street - ? 92 Tullow Street - Byrne The plaque below is on the wall to the right of the shop. 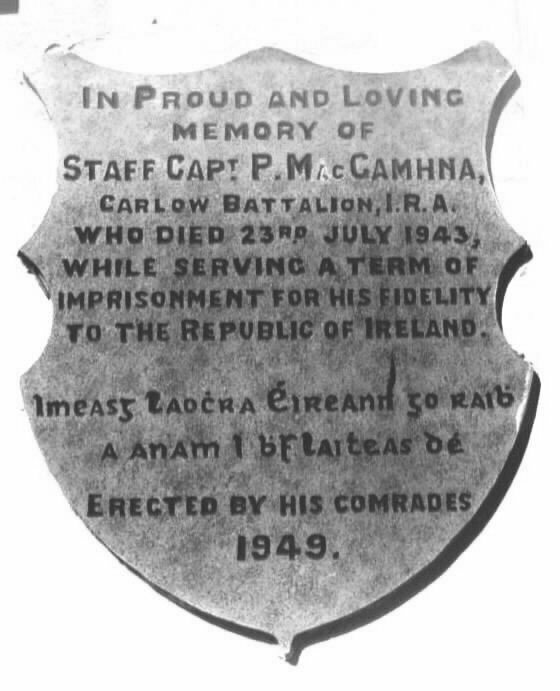 The Plaque reads: In Proud and Loving memory of Staff Capt P. M. MacGamhna, Carlow Battalion, I.R.A. who died 23rd July 1943, while serving a term of imprisonment for his fidelity to the Republic of Ireland. Imeasg laochra Eireann go raihh a anam i bhflaitheas De. Erected by his comrades 1949. 93 Tullow Street, No information available at this time. 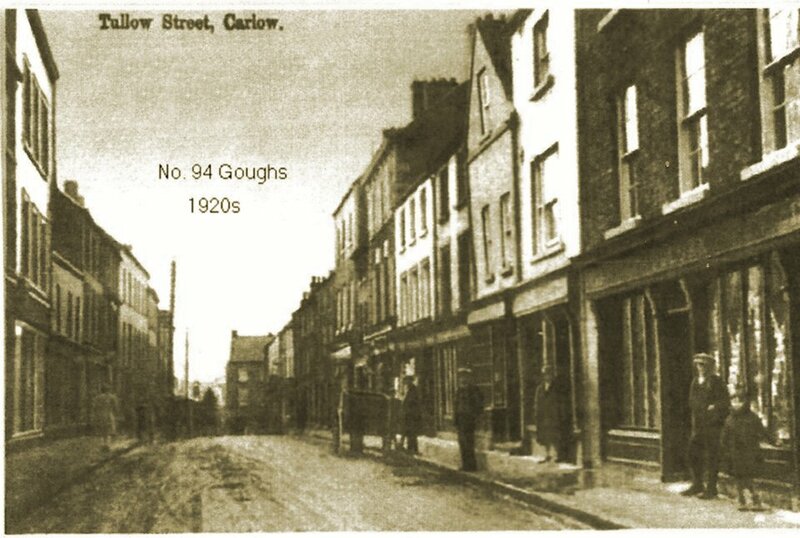 94 Tullow Street - Goughs c.1920. This photo was donated to the Carlow website by Anna Nolan Gough. 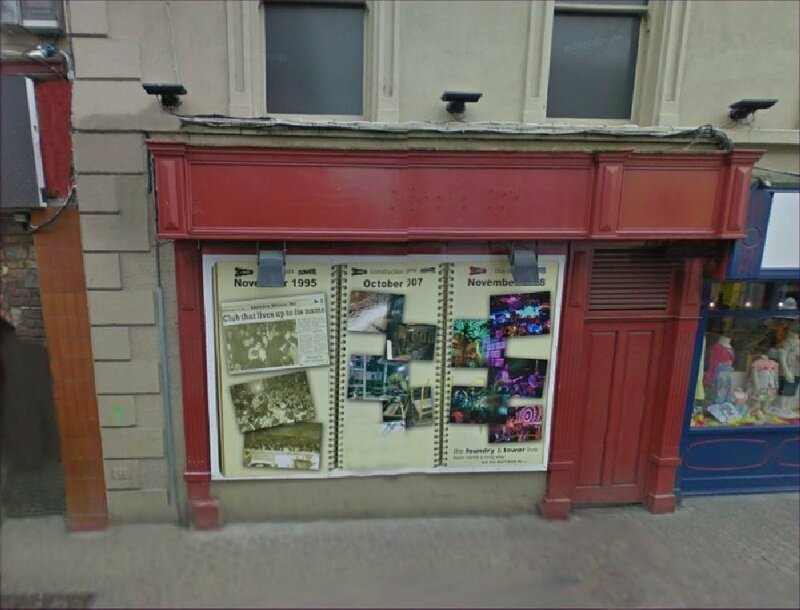 95 - 110 Tullow Street - ? 111 Tullow Street - Mary Walsh ran a most successful Bakery & Confectionery on these premises for many years. It is now occupied by Celtic Cleaners. 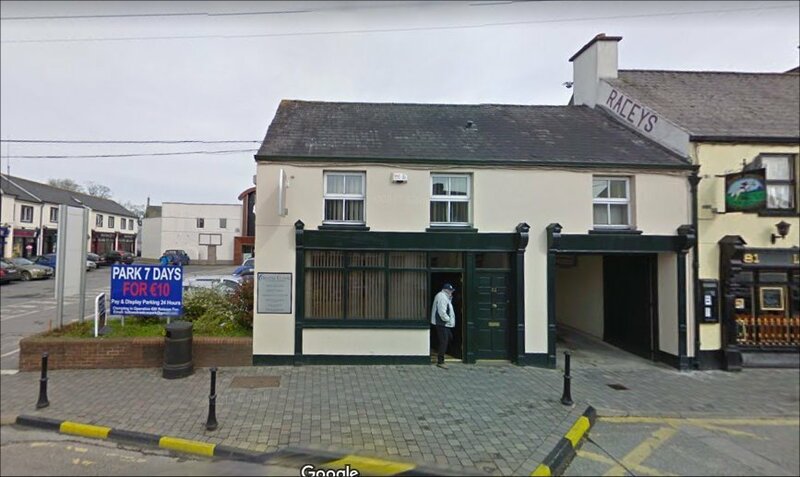 112 Tullow Street - J. McDonalds - Public House & Grocery which replaced the 'Cather Inn' is one of the oldest established business premises in Carlow. It has remained in the same trade since 1668. Foley Bros were Family Grocers and Wine & Spirits Merchants. It was then called “The Old House” in the 1930/40s and then "Dinty Delaneys". It was then renamed "The Bad Shilling" for a short while when it was owned by Ned Dowling. 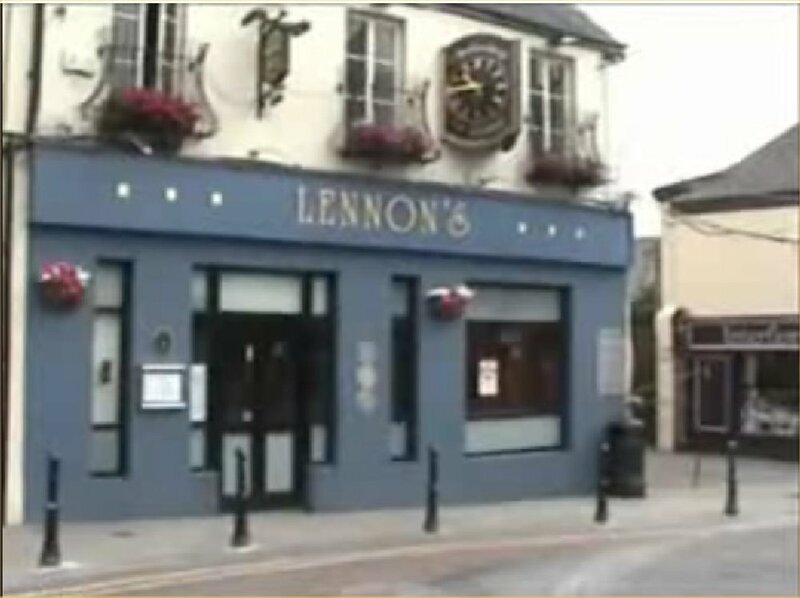 It then was bought by a popular publican namely Aidan Lennon and was renamed "Lennon's Corner". Also at that time it became known as "The Pan of Rashers". Aidan Lennon who had originally opened a public house in the early 1970s in Toumeys grocery and bacon shop in Tullow Street. 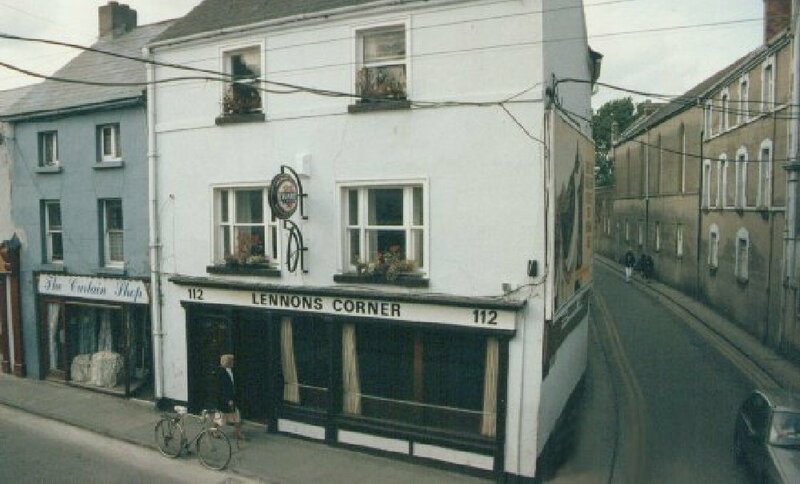 He relocated to 112 and renamed the public house "Lennon's Corner" in the early 1980s. It is on the corner of College Street and Tullow Street. 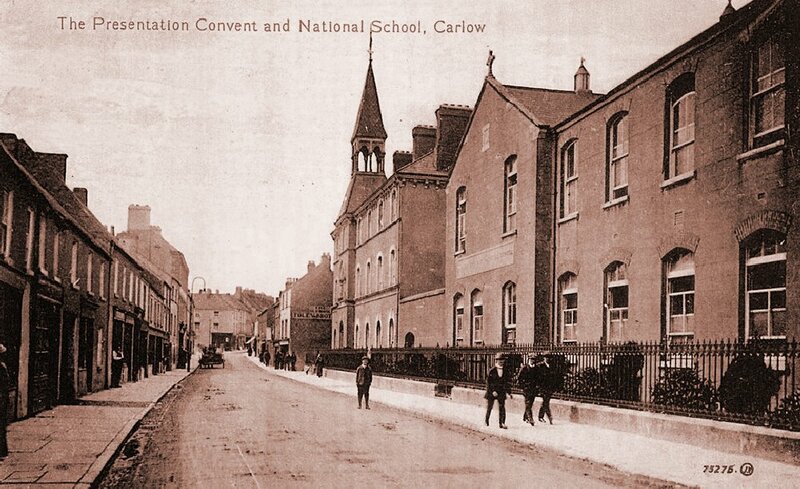 The Presentation Convent on the next corner is now the Carlow County Library. The premises is today (2006) known as "The Med Bar". Note from Michael Purcell: The issues between Ned and Aidan Lennon led to a very serious "falling-out" between the brothers and their families. Ned always owned Lennon's Pub, he rented it to his brother Aidan, who returned from Chicago and ran the pub for many years, and when the Lease expired Ned evicted his brother from the pub and Ned and his wife May then ran the pub and in the meantime Aidan bought the pub on the corner of College Street and opened his own pub, called Lennon's Corner, it also became known as "The Pan O' Rashers" because every evening Aidan would say "I'm going home for the pan of rashers" he often invited customers to join him, as he often brought me home with him for something to eat... returning to the pub later for the continuation of the drinking session. 113 Tullow Street - The Presentation Convent. 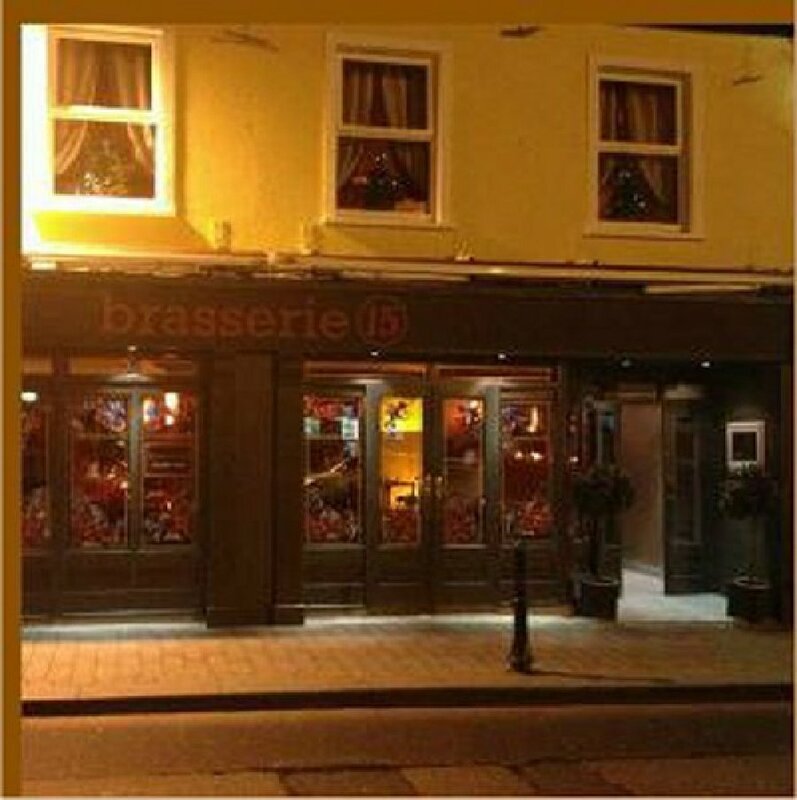 114-115 Tullow Street - Lautrec’s Brasserie. 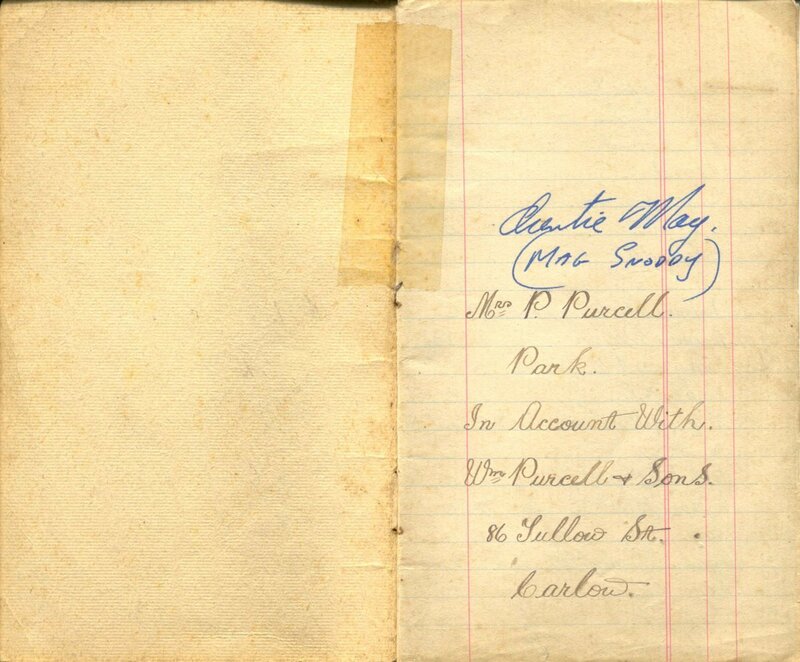 In 1881 Ann Mahon was at 114 Tullow st as a Provision Dealer; Someone who worked as a merchant buying and selling provisions such as meat, cereals, fruit and vegetables. 120 Tullow Street - William Brennan Artificial Manure Merchants & Agents according to Slaters directory of 1881. 121 Tullow Street - "When King James II came to the throne of England in 1685, Mr Browne suffered great hardships and loss. His house was occupied by his enemies and his family imprisoned. His land and stock sequestered and plundered and still worse might have happened only for the intervention of a worthy and respectable Roman Catholic gentleman of the name of Allen from Pollerton near Carlow town. 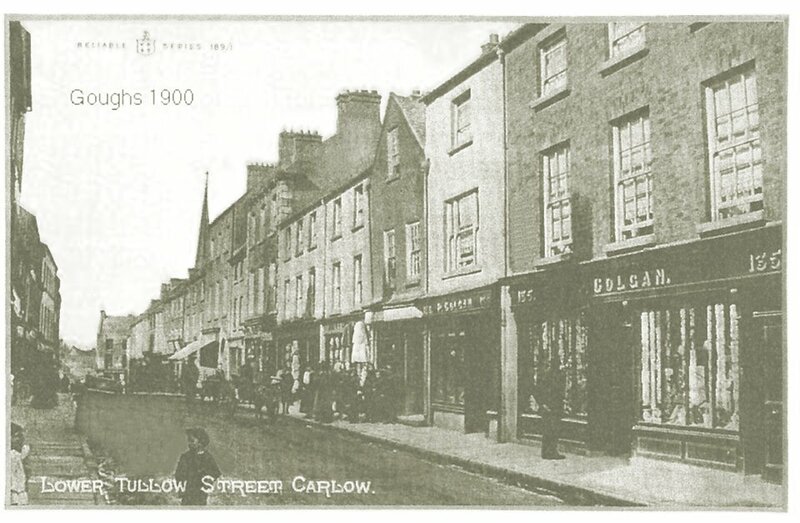 Upon their release Robert Browne-Clayton built a roomy Mansion close to the Tullow Gate in Carlow town." In 2007 Lennon's Cafe Bar occupied these premises. 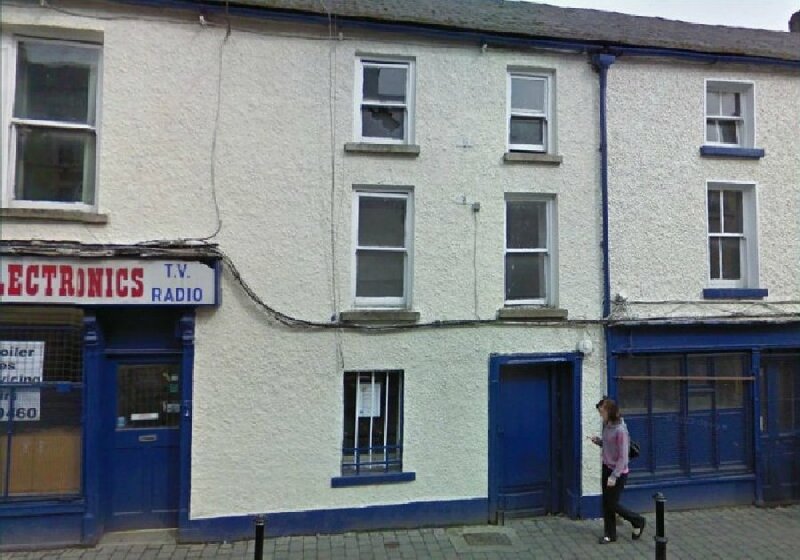 122 Tullow Street - This was also the location of Thomas (Tom) Doran's Outfitters. The shop was then taken over by Sheile Holden in the 1970s and it had the name Holden's (I will get the exact name for you) until 1989. Source of the Doran's info comes from Stephanie Howard . Tom Doran was Stephanie's Great Grand Father and Sheile Holden was her Great Aunt.. Note: Thomas Doran his wife Anne and his daughter Bridget are listed in the 1911 Census under 82. Yellow Street. Carlow. (Mistake in the census it should read Tullow Street) MB. 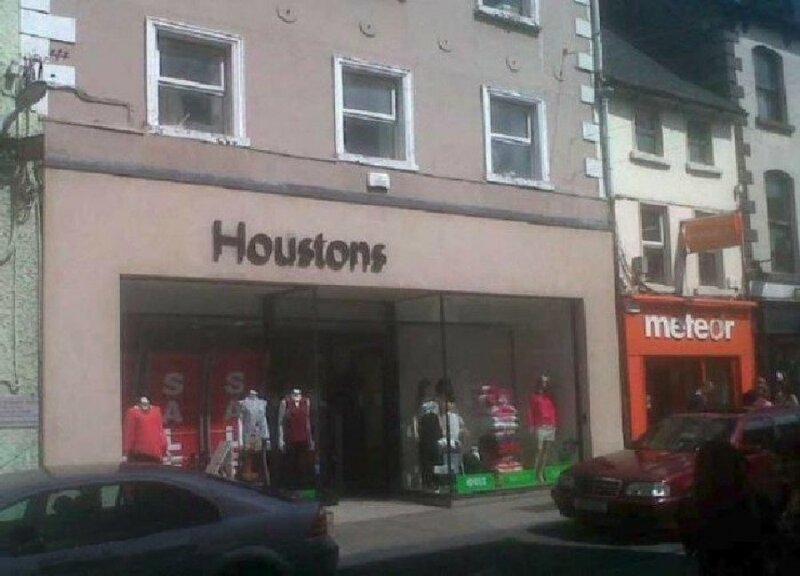 This shop was well known for the supply of outfits for boys and girls taking their 1st Communion and Confirmation'. 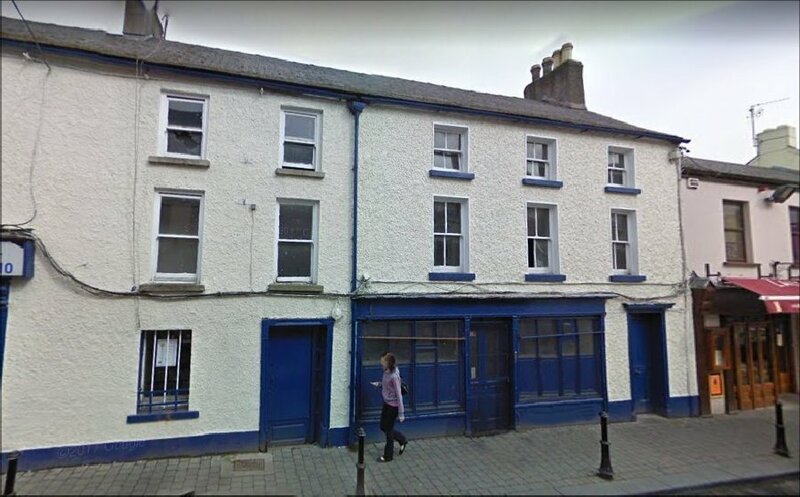 124 Tullow Street - Thomas Treacy publican according to Shearman’s Directory New Commercial Directory for the Town Carlow 1839. 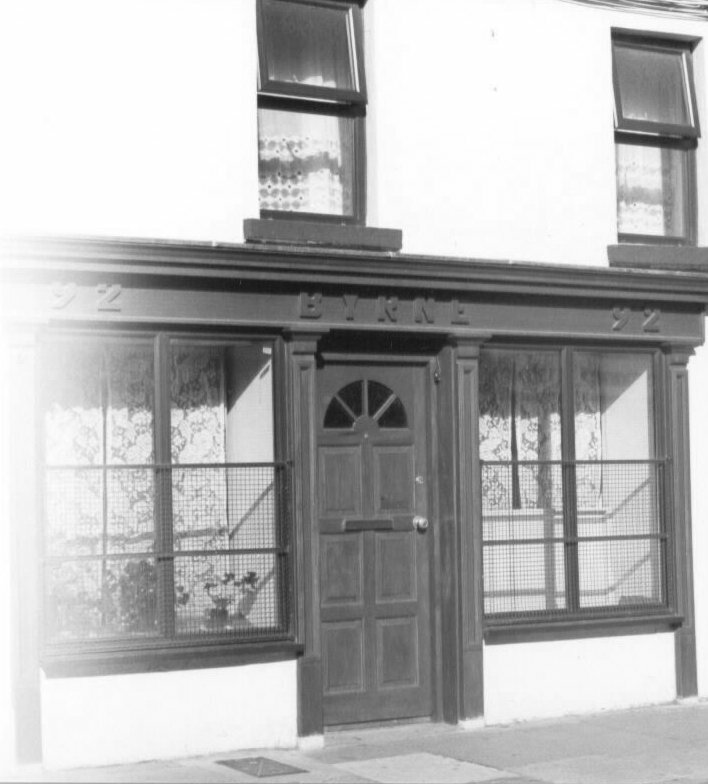 125 Tullow Street - Mrs. Crotty is the proprietor of “Creations”, a Ladies’ and Children’s’ Boutique at 125, Tullow St. where Mrs. James Walsh had a Grocery & Confectionery business. 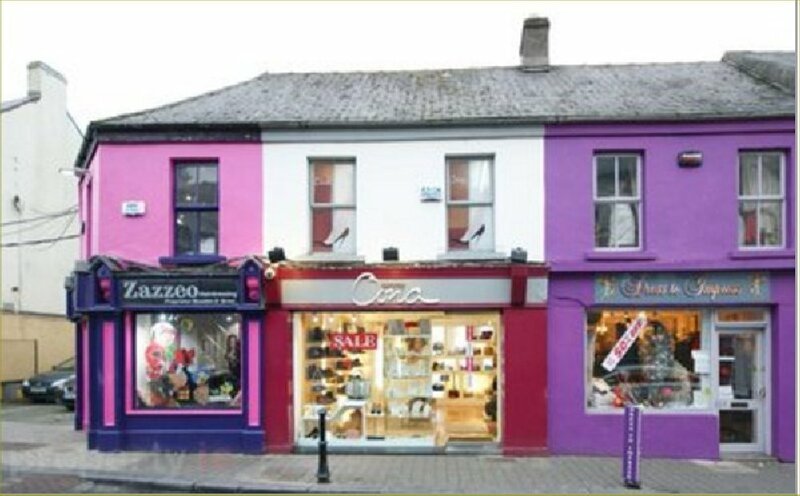 126 Tullow Street - According to The New Commercial Directory for the Town Carlow. 1839. there was a Mr. Andrew Dwyer, Baker, occupying these premises. 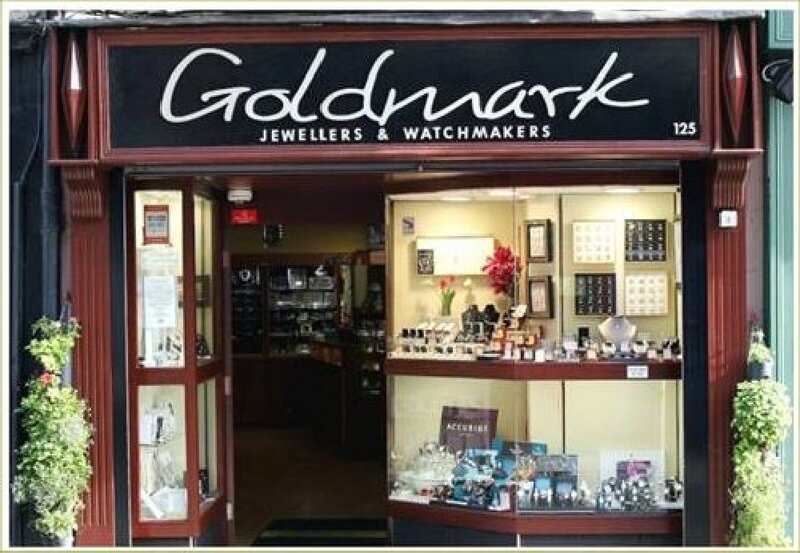 Picture required 127 Tullow Street - Goldmark Jewellers, and Watchmakers. 128 - & 121 Tullow street - William H. Boake a grocer & baker, according to Slaters directory of 1881. 129 Tullow Street - ??? 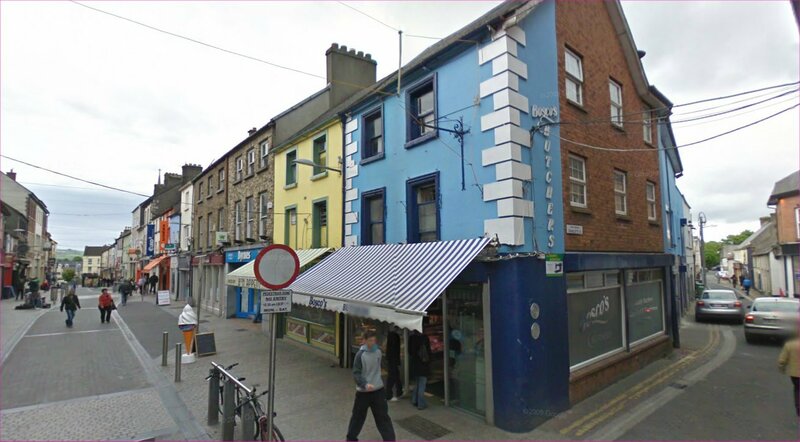 130 Tullow Street - in 1839 there was a Joshua Haughton; Leather Seller. In 1846 Margaret Ryan was in the Linen & Woollen trade. In 1870 the premises on 130 & 131 was occupied by Matthias Tynan Car and Coach Owner. Source: Slaters Directory. 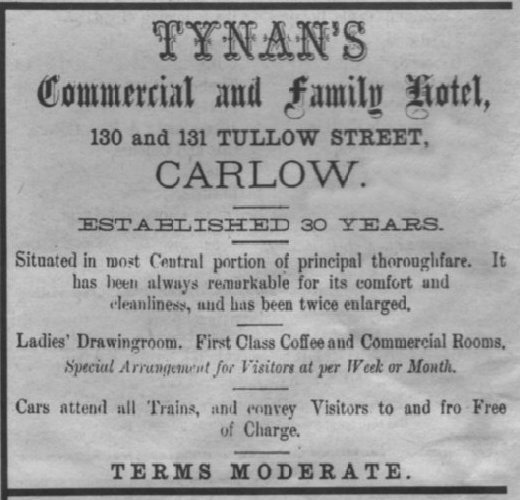 Picture required Tynan’s Commercial & Family Hotel, 130-131 Tullow St. advertised that it was unbeatable for its excellent cuisine and extensive Grillroom. It was renowned for its large Ballroom, Lounge and Supper Rooms, the largest in South Leinster. M. J. Dease, the proprietor’s nephew, was the manager. It was replaced by the Ritz Cinema. It was opened in the 1850's. Source: Nationalist Directory of Carlow of 1888 Adverts. 132 Tullow Street - Bosco's butcher shop. Quality Meat, Fish and Poultry. In the 1950's this was Atkinson's toy and bicycle shop. 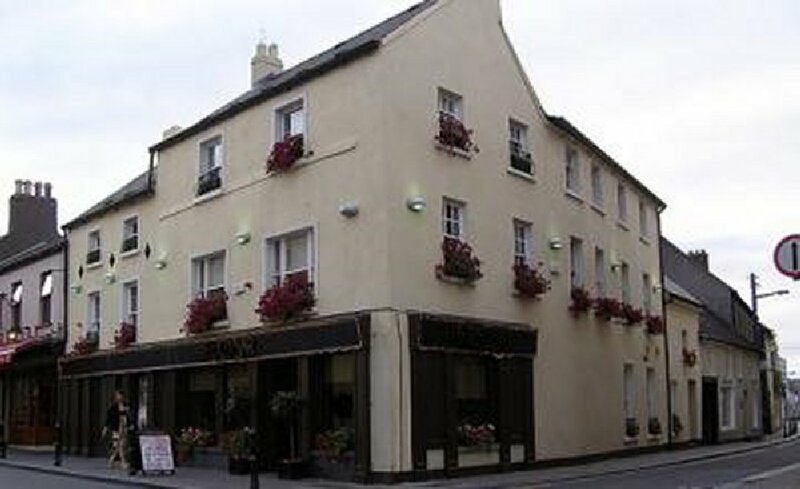 133 Tullow Street - Tynan’s Hotel, advertised that it was unbeatable for its excellent cuisine and extensive Grillroom. It was renowned for its large Ballroom, Lounge and Supper Rooms, the largest in South Leinster. M. J. Dease, the proprietor’s nephew, was the manager. It was replaced by the Ritz Cinema. This building was in poor condition but is now being renovated. Cosmo Brown @ The Ritz now occupy this site. 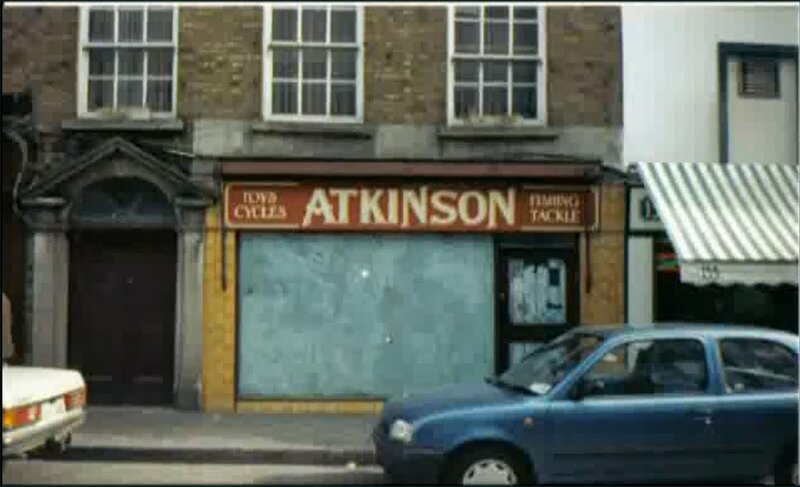 134 Tullow Street - Atkinson's old Toy, bicycle and fishing tackle shop. I remember when my mum bought her first new bicycle form this shop in the late 1950's. Byrnes bookshop. 135 & 136 Tullow Street - P. Colgan had a Stationery and Fancy Goods Warehouse here and was a branch of the Torch Library. Allied Irish Finance now occupies number 135. This photo was donated to the Carlow website by Anna Nolan Gough. Picture required 136 Tullow Street - This was the residence of Gerald Kehoe who had a Radio & Television business there for many years. TOP GEAR’ now occupy the premises. 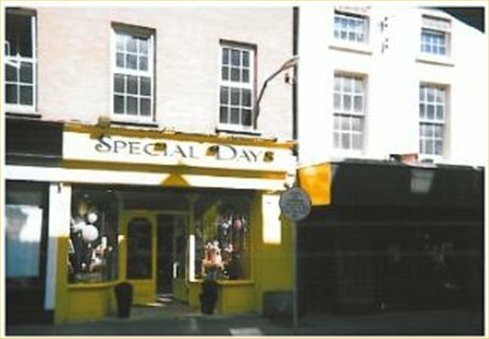 137 Tullow Street - This was once the premises of Patrick Molloy had a Bakery & Provisions Shop. 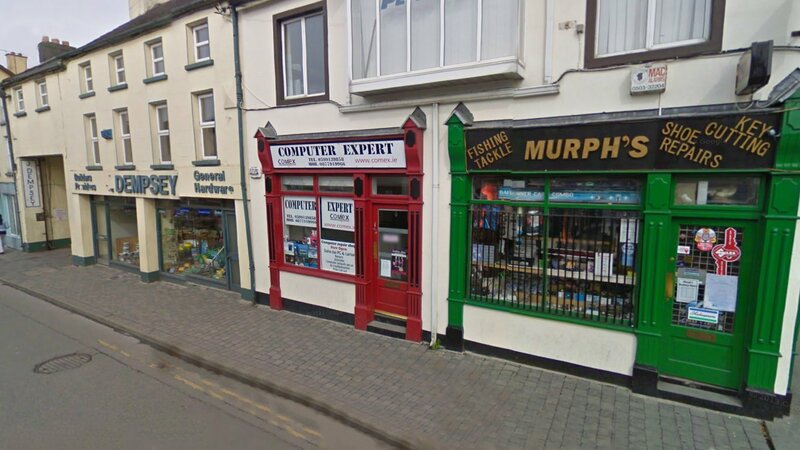 It is now occupied by M/S Tully Travel Agents. Picture required 138 Tullow Street - M. J. Graham had a small Drapery for Ladies and Children, also Millinery and Haberdashery. Eilis O’Neill is the current proprietor of a successful Confectionery, Stationery, Cards and Souvenir business. Was also a Hosiery factory. 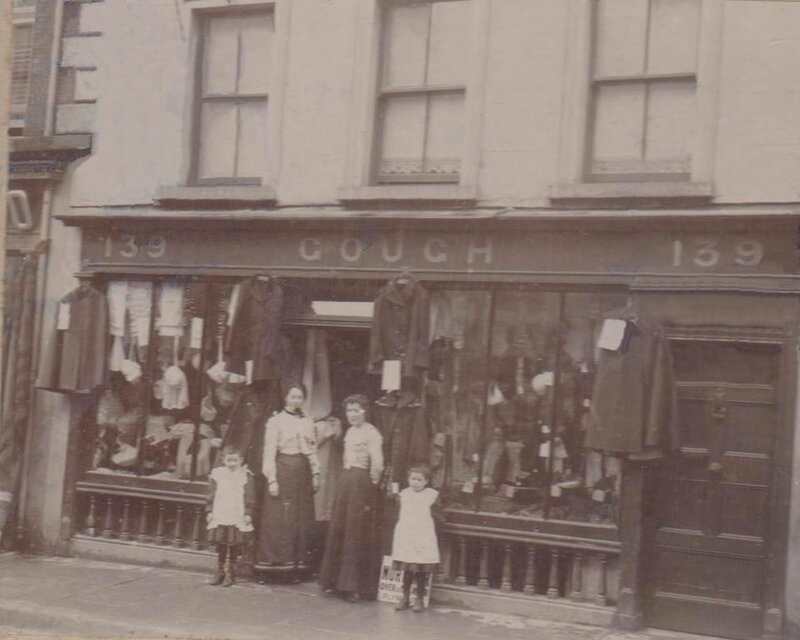 139 Tullow Street - Mrs. Robert Gough carried on a Drapery, Millinery, Boot & Fancy Warehouse at these premises. Her daughters sold the premises to George Good for his hardware business. Later he sold it to M/S Saxone for a Boot & Shoe store but he retained Gough’s shop for the sale of Paints and Wallpaper supplies. It is now EuroZ. 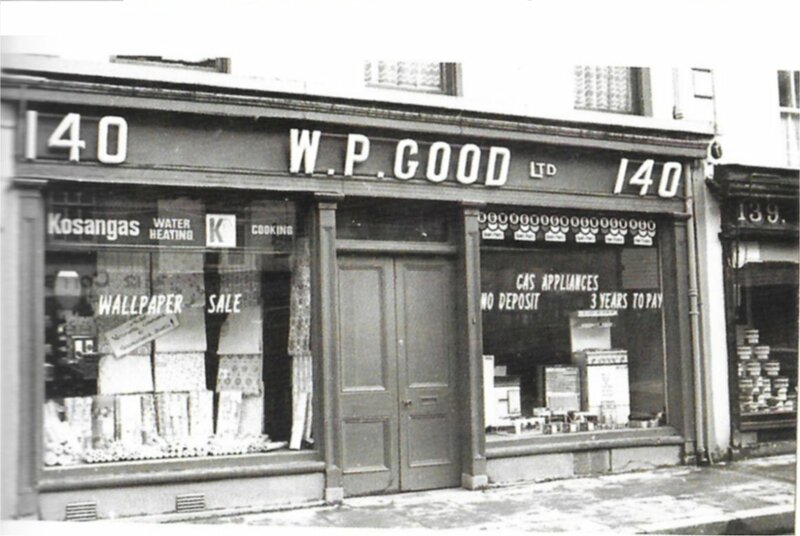 140 Tullow Street - W. P. Good Ltd was founded on 1947 and had its registered office in Carlow. It traded in household decorations. 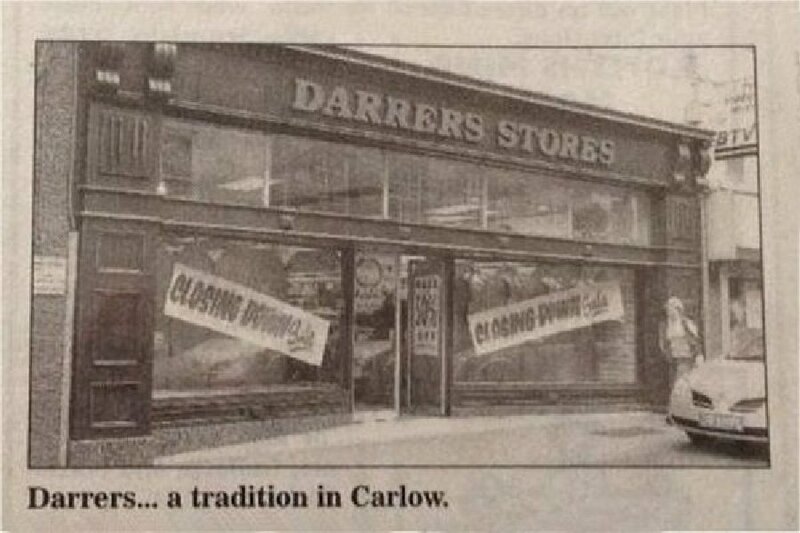 Image source Old Carlow Photos by Dermot O'Brien. In the 1881 Slaters Directory of Carlow Albert Morris has an Ironmongery business at 140 Tallow street. 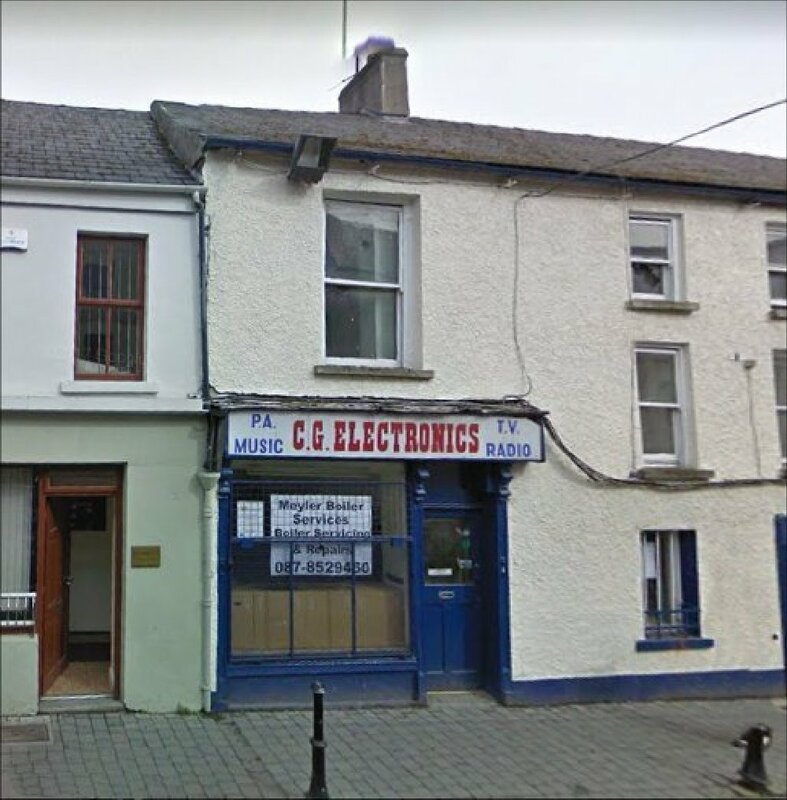 Picture required 143 Tullow Street - Once was occupied by The Carlow Book Shop was owned by McHughs (1990) now occupied by GRAHAMS. Picture required 145 Tullow Street - Tuomey’s Bacon is “the talk of Carlow” according to their advert., also their Teas & Grocery. “Denny’s” quality only stocked. They also have an Auctioneering business under the title, “Real Estate House”. 146. Tullow Street - Dan McDonnell's Bakery in 1940, most viewers will remember the brass rail alongside the shop window, it always had a Brassoed glint ~ in recent times the premises was Bradbury's Bakery and Restaurant in 1970's, today it is Elverys Sports Supplies. ~ The advert in the window is for Bermaline Bread. Picture required 147. Tullow Street - Peter Belton operated a Hardware shop here. Tully's was owned by McDonnell's directly across the road. 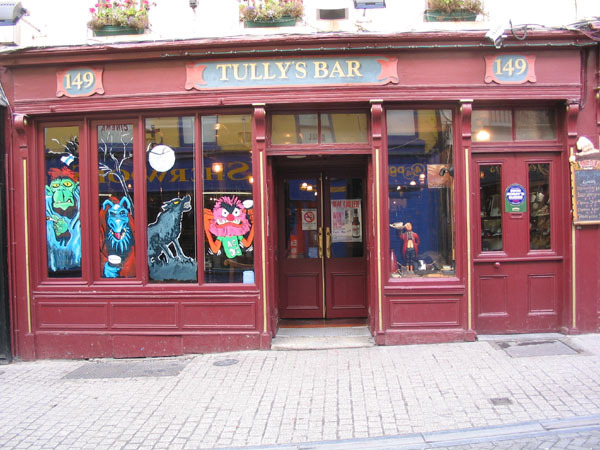 There was a McDonnell/Tully marriage which united these two pubs. 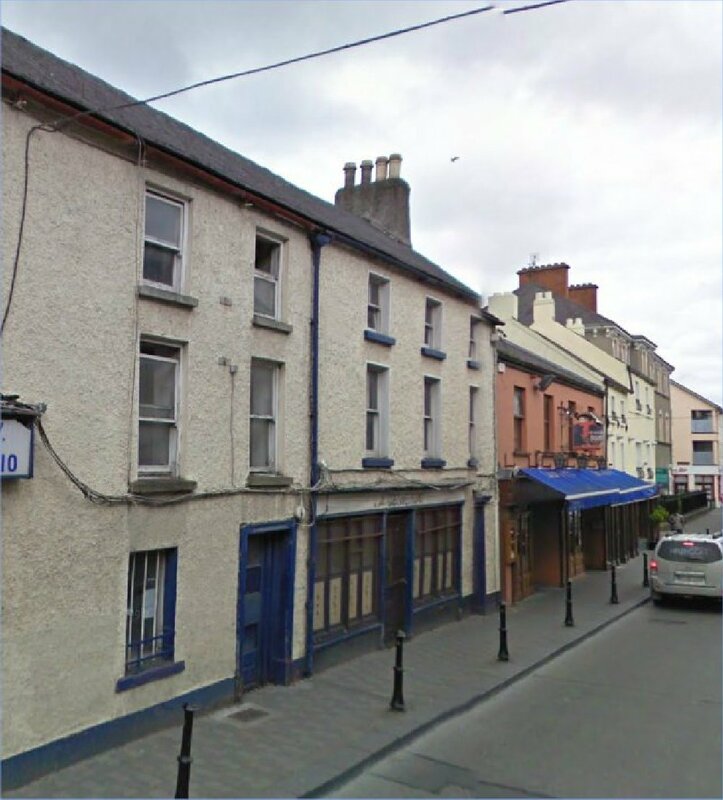 There was also a Ms. McDonnell who was a chiropodist and she operated out of McDonnell's pub (upstairs) initially and later moved to College St. She was bridesmaid at Dr. Gareth Fitzgeralds wedding. 150. Tullow Street - now occupied by COCOON Maternity and Children's Clothes. (The above photo appeared in Michael Purcell's article on Tullow Street - August 25th 2006 in The Nationalist). 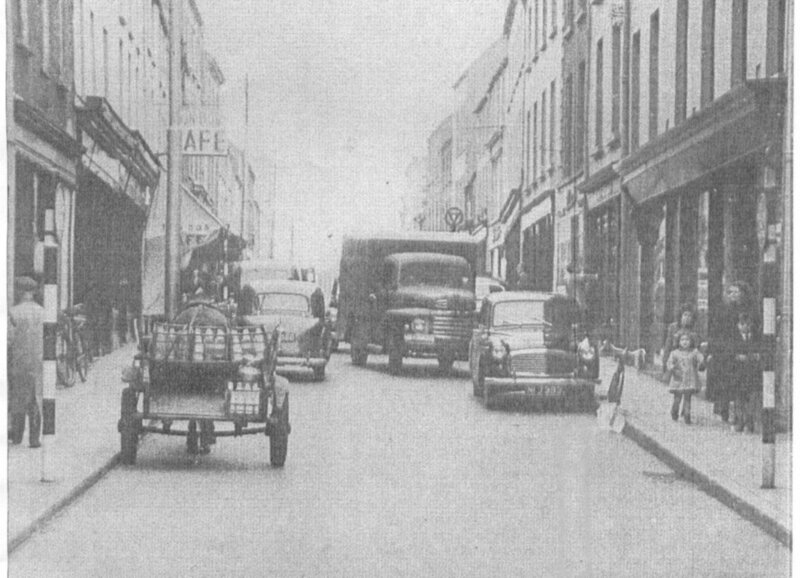 150 Tullow Street is bottom left of the picture next to the Milk cart. Picture required 151. Tullow Street - is where Nolan's chemist ended up in 60s 70s etc, you could enter by Dublin St. or Tullow St. and they did a great business in the side door on Tullow street in photos, particularly passport photos. They also sold cameras and had a great display in the window. Later on BENETTON occupied this shop. You will have noticed that a number of photos of shop fronts are missing from these pages. If anyone can provide a copy I would be most grateful. Additional edits by M. Brennan, J. J. Woods & Anna Nolan Gough.